The trunk of the car looked like a mobile police narcotics lab. We had two bags of grass, seventy—five pellets of mescaline, five sheets of high—powered blotter acid, a salt shaker half full of cocaine, and a whole galaxy of multi—colored uppers, downers, screamers, laughers and also a quart of tequila, a quart of rum, a case of Budweiser, a pint of raw ether and two dozen amyls. All this had been rounded up the night before, in a frenzy of high—speed driving all over Los Angeles County—from Topanga to Watts, we picked up everything we could get our hands on. Not that we needed all that for the trip, but once you get locked into a serious drug collection, the tendency is to push it as far as you can. P.S. 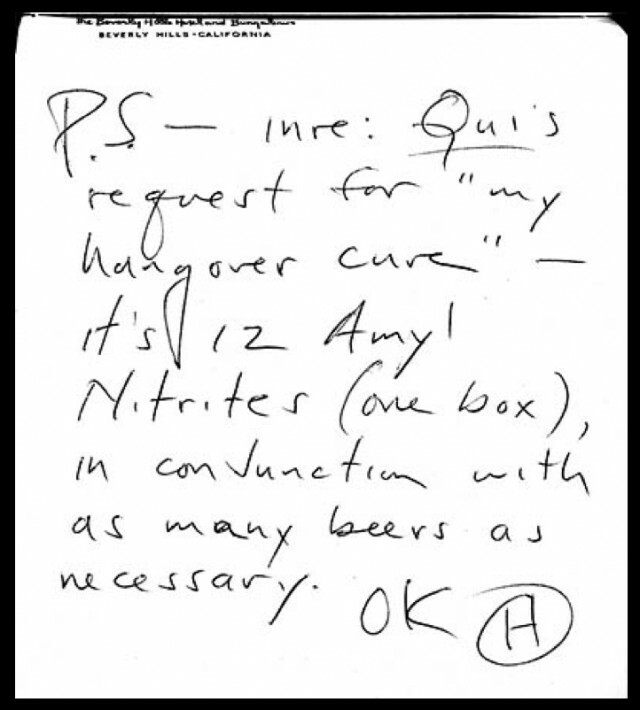 — inre: Oui's request for "my hangover cure" — it's 12 amyl nitrites (one box), in conjunction with as many beers as necessary. As a PSA to stave off angry comments, a spoiler alert: SciShow’s recommendation is on par with the abstinence model of birth control: just don’t do it, and you’ll be fine. The thing I dislike most about this article is the posture of the reporter. He seems to be bragging about and celebrating the drug addiction rampant in the performing arts community. I think it would be better, more productive in the long run to make the point these people ruined their lives with alcohol and drugs. That’s my 2 cents! I don’t recommend the sports drinks. Their sugar and acidic levels will dissolve your teeth. I suggest two pint glasses of almond milk.